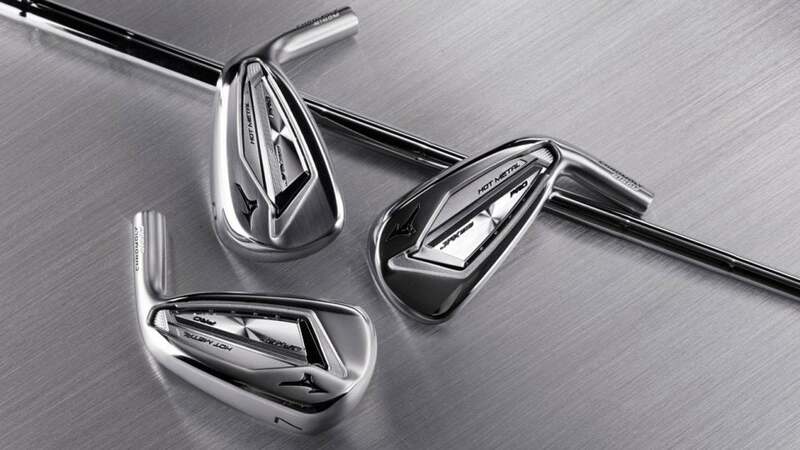 The new Mizuno JPX 919 Hot Metal Pro irons. The newest member of Mizuno's JPX 919 family is the Hot Metal Pro irons ($999), which join the Tour, Forged, and standard Hot Metal models to make one heck of a lineup. Constructed from the same unique Chromoly material used to build the standard JPX 919 Hot Metal irons, the new Hot Metal Pro is aimed at better players who want max speed and distance in a more compact profile. A closer look at the Mizuno JPX 919 Hot Metal Pro iron. The new model features a multi-thickness face for big-time ball speeds and a seamless one-piece face construction for the enhanced feel and feedback better players prefer. Re-engineered sound ribs further enhance feel by transmitting player-preferred vibrations at impact, while a more durable finish ensures the Hot Metal Pro will look good in the long term. Other key features include slimmer top lines and soles, reduced offset, and more compact scoring irons and wedges. The Pro model is also engineered with a steeper transition into the short irons and wedges as well as precision milled grooves for enhanced spin and control. The new JPX 919 Hot Metal Pro irons will be available at retail in February, 2019.